After firing head coach Dallas Eakins, Edmonton Oilers general manager Craig MacTavish spent roughly two weeks behind the bench alongside interim coach Todd Nelson. When he went back upstairs, there was a flurry of transactions that brought about significant change to the roster. One of those moves was a trade that saw undersized centre Mark Arcobello go to Nashville in exchange for fellow undersized centre Derek Roy. What’s happened since is pretty interesting. This was largely a lateral move, involving similar players in similar roles. Adding experience to a young team has value. Shaking things up for a losing team has value. As far as change-of-scenery trades go, this looks like the kind of deal that worked out well for both players. Mark Arcobello has 19 points in 38 games (with three different teams!) since being traded and most recently emerged as Arizona’s No. 1 centre. Derek Roy has 21 points in 43 games since being traded and has developed obvious chemistry with Nail Yakupov. Win/win, right? There are two key issues that I think are worth a closer look beyond the point totals of the two players. The first is what was the dominant narrative in our comments section at the time of the trade: Would the Oilers have been better off keeping Arcobello and additionally claiming Roy off waivers? The second is what has become the dominant narrative since: Roy’s chemistry with Nail Yakupov. Regarding the first point, with the benefit of hindsight I think we can say that, yes, the Oilers probably should have kept Arcobello and simply added Roy rather than making a one-for-one trade. We’ve seen Benoit Pouliot, Taylor Hall and Rob Klinkhammer at centre (not to mention Matt Hendricks, who has been basically full-time in the role lately) since thanks to injuries, and we’ve seen Oklahoma City stripped bare of forwards as both NHL and AHL club see players fall. Arcobello would have helped. With that said, it’s hard to get too bent out of shape about the decision. Arcobello has seen waivers since being traded to Nashville. Keeping some space on the 50-man list has value. The Oilers couldn’t have known they were going to keep Roy, and trading for him allowed them the flexibility to move him at the deadline if they so desired. In hindsight, I’d agree with the commenters here who wanted to keep both players, but I’m not particularly critical of MacTavish’s choice since things could easily have worked out differently. The big point in Roy’s favour that isn’t in Arcobello’s is that Roy and Yakupov have a natural chemistry that Arcobello and Yakupov lacked. Or is that really the case? I want to give a nod here to Twitter user @CervantesX, who published a lot of the numbers I’m going into now last night; he beat me to the punch on it by a number of hours. Anyway, thanks to the magic that is Stats.HockeyAnalysis.com, we can take a long look at how players perform with and without each other and it’s awfully interesting to see how Roy/Yakupov compare to Arcobello/Yakupov at five-on-five this season. Lots of numbers there, but it’s hard to see that Yakupov has been any better with Roy than he was with Arcobello. His scoring rate is completely unchanged, and the Oilers did a better job of out-shooting and out-scoring the opposition with Arcobello as his centre than they have with Roy as his centre. Arcobello/Yakupov had the advantage of favourable zonestarts (Eakins comes from the Alain Vigneault school of zone-matching; Nelson does it somewhat but not with the same zeal) but even so it’s hard to make a case that they were less effective than Roy/Yakupov. Before Roy’s arrival, Yakupov didn’t play exclusively with Arcobello. He played a lot with Ryan Nugent-Hopkins (that was a disaster) and also with Leon Draisaitl (and that duo was either totally incompetent in the offensive zone or just wildly snakebit). So in our minds we aren’t really comparing Roy/Yakupov against Arcobello/Yakupov; we’re comparing Roy/Yakupov against Assorted/Yakupov. The power play. 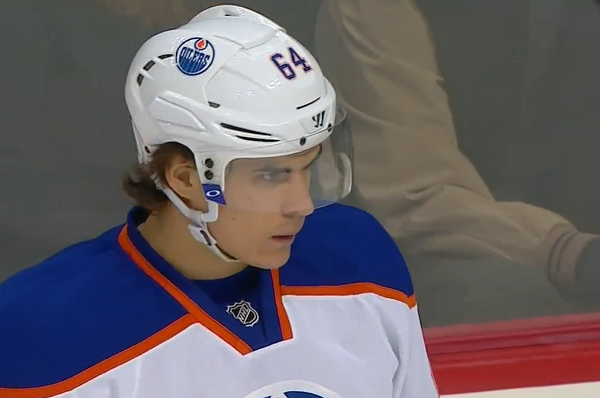 On the day that Arcobello was sent away, Yakupov had all of two power play points in 35 games. The arrival of Roy coincided with a) Todd Nelson taking sole control behind the bench and b) a massive uptick in the Oilers’ power play. In the 38 games since, Yakupov has seven points on the man advantage, a more than three-fold increase. This isn’t a criticism of the trade. I think there’s a time and a place for change-of-scenery deals, and the Oilers were absolutely in the right place to make one. Adding a veteran was probably a good thing. Shaking up the room was probably a good thing, too. It’s nice to see that the deal has worked out well for both players. But digging into this subject, my takeaway was that as a community following the Edmonton Oilers we probably overrate Roy’s importance to Yakupov. If Yakupov could do very similar work five-on-five with Arcobello as he has with Roy (and as we’ve seen, he did) it’s likely he could be just as good with another pivot – and another pivot might be a better fit for team need than the somewhat one-dimensional Roy. It’s something for the Oilers to keep in mind when they make a decision on the player. As a rule, Edmonton’s management has done an awful job of keeping enough centres around, and at the right price Roy would add some depth at a position that needs it. But only at the right price. Roy has been a good fit with Yakupov but he’s far from irreplaceable. that the corsi is so close is a nod towards Roy is it not? possible. They were destroyed anytime they were in their own end. I still think we need a a 1/2C but Roy has been very good for us. Does it really matter any more? The season has been over for months, we faithful fans have put up with more misery, embarrassment and humiliation. Same as before. We get the new arena updates thrown in our faces and we are supposed to be enthusiastic? What is the point of the best arena in the NHL when the worst team plays there? We HAVE to climb out of the basement in the standings next season, I know we say this every year, but fans are deserting in droves, we have no confidence in the “coach killer” players, in fact we really don’t have a lot of faith in anything right now. Is this a case of the Monday blues? – no, it’s called the reality of a pissed off Oiler fan. Sooo, I guess he is just visually better? – in all seriousness he looks far less chaotic with the vetern center. Sometimes I wonder if you actually recognize good hockey plays. Roy does a lot of good things out there. If you’re going to blast a player for his age and a few bad games you should hold all of the players to the same level of critique. Hall gives the puck away ( the worst thing a player can do) far more, yet no mention of that? And don’t give me the weak argument concerning “well he has the puck more”. Here’s an analytics idea. Take TOI totals for both players and track the number of giveaways by each. My guess is Derek Roy isn’t as one dimensional as you purport. Well the problem is that if we use that system as a basis for rating players, John Tavares is the worst player in the NHL. I wouldn’t suggest using that any more than any other piece of Statistical info in evaluating a player. It’s merely a bit of insight and perspective as are all the rest. “Giveaway” is open to interpretation and in my mind should only be considered when it happens in the absence of direct heavy forechecking pressure. I highly doubt Johhny Tavares is culpable of true giveaways, but if he does it’s surely a sore spot for coaches and Isles Management. Something they like spend a good deal of resource and time on rectifying. Sorry but I just disagree that Roy is a one dimensional hockey player as you say and would further add that you should reconsider your evaluation “bases” if you truly believe it. Look at the work he has done in Phoenix; he has taken that team on his back and brought them all the way down to 29th. 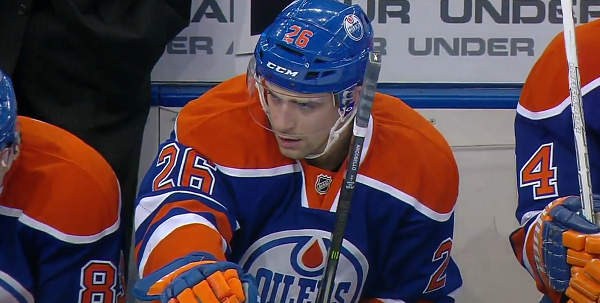 Imagin what he could have done with The Oilers’ roster all year. Could have set a new NHL low for points. They could have grabbed Roy off waivers for nothing, but they decided to give away a free asset instead. Arco was as free as an NHL player comes: not drafted, pro-scouts spot him, works his way up through the ECHL, on a $600K contract. At the time I thought if a blockbuster deal was coming you might want to save some contract space but Mr. Dithers II seems to have had no such deal in the works. Yeah, we’re talking borderline NHLers but they are both currently NHL players and our roster has a severe lack of NHL players. It was simple asset mismanagement and indicative of the idiocy of the management team. At the time I prefered Arco but I see now that Roy brings some veteran wisdom to the team (and Yak) and I like that, but we could have had both players for nothing. I agree with you except I did/do prefer Roy over Arco. I think Arco should have been a well paid AHL with call up potential. I really like what Roy has been doing with the Oilers. He’s more competitive than I expected. He does have NHL Scoring experience. He is playing for a contract so I don’t know if we can expect the same next year if he’s signed to a multi-year. What continues to befuddle me is why one or two other free agent centers were not signed going into the season. Any with NHL experience would have improved the team going into the season. Unless the intent was to tank right off the bat. If you think for a second that Yak hasn’t been better with Roy than Arco then you should not be allowed to write about the oilers ever again. Your article is exactly what is wrong with advanced stats. Anyone can see that Yak is a better player now than he was and anyone can see that Roy is more valuable than Arco. And if their intent was to tank going into the season, they didn’t do a very good job at that either. I think that the biggest change was one coach harping on the mistakes and the other harping on the positives which boosts confidence. I’m in the camp that thinks it was stupid to trade for a player you could have had for free. Asset management, especially when you need all the assets you can get to try and make some sort of deal to help the team and not ones that made them go sideways. As I’m not in the rooms at any time, it could also be that they did Arcobello a favor, not sure why else you’d get rid of a center when you need them. what was/is the intentions going forward is what we dont know,tanking? (after 3 1st overall picks already) is it really that difficult to attract players here lets ask a few ex players like p ronger, sourey, comry, horcoff, klima, bucky etc. This would be a McDavid tank. It could have been planned for at least the past couple of seasons. Seriously how does this bum (Willis) get a blog here? Roy is an actual NHL Veteran. He has a resume of over 700 games in any NHL uniform, this guy knows what it takes to stick in this league. Yak has learned tons and tons from this guy both on and off the ice. It’s thinking like yours who keeps this team a perennial cellar dweller, you don’t pay guys like this to make you points. You effing pay guys like this to give your young guys pointers. I’d take a 1 Derek Roy over 100 Mark Arcobellos now. Derek Roy has been there, Mark Arcobellos hopes he can be there. Oilers need some space to sign other young players, approaching 50 soon. Traded Mark for Derek Roy is a good move, no point keeping both small forwards. Oilers need to spank LA Kings tonight, Scrivens better stand on his head for the win. I think Arco was better defensively than Roy. I say resign Roy for cheap but if they can get someone better they need to act. We all now know that you can throw any Corsi stats from the Eakins regime. He was jigging the stats by getting the team to play a style that improved Corsi, BUT WAS THE WORST HOCKEY EVER! NOBODY should look back at anything from the Eakins era and conclude that it was superior to even the meager success we’ve had since. Ignore the Corsi column for a moment. Are goals and reality two different things? What about points and reality? Have you considered the possibility that your problem is just facts in general? You know, the basic idea of looking for evidence to support your gut feeling?